The next iteration of the annual ESPAUR report has been published. It’s a comprehensive, epic tome (almost 200 pages, plus an online appendix if that’s not enough for you!) so, I’ve summarised a few key points here – but the whole report is well worth a read. The number of Gram-negative BSIs is increasing (and we don’t know why); overall antibiotic prescribing is down driven by GP reductions; there’s a small increase in antibiotic prescribing in hospitals overall but early success in reducing broad spectrum agents (pip/tazo and carbapenems); and the results of the national PPS are out! The number of GNBSIs is up ( coli from 32,000 in 2012 to 40,000 in 2016; K. pneumonaie from 5,000 in 2012 to 6,500 in 2016); resistance to key antibiotics substantial but stable (e.g. co-amoxiclav resistance in around 40% in E. coli and 25% in K. pneumoniae). Carbapenem resistance remains low in BSIs. We don’t understand why the number of GNBSIs is increasing, and it’s not easy to explain the regional variation in these numbers either. More research required here. 50% of coli BSI had urinary source. Data from 1m urine cultures reinforces the need to switch from trimethoprim (34% of community UTIs resistant) to nitrofurantoin (only 3% of UTIs resistant) for empiric treatment of UTIs in the community. 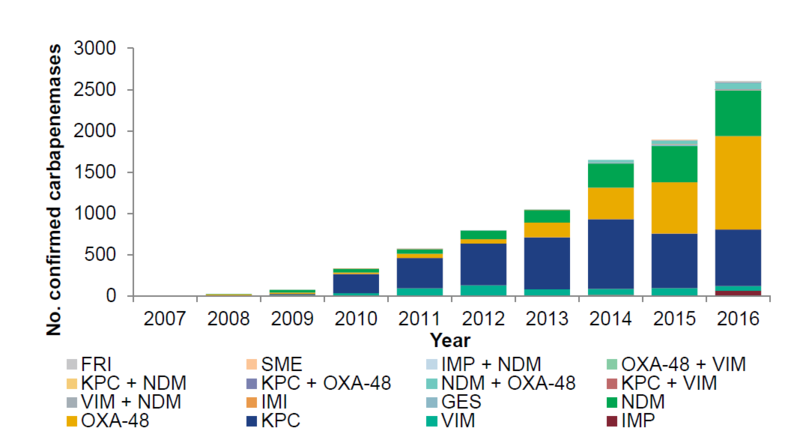 Referrals of CPE to the national ref lab continue to increase – up to more than 2,500 in 2016, with OXA-48 now being the main culprit (Figure 1). It’s still not clear how much of this is explained by ‘referral’ bias, increased screening, or a genuine increase; I suspect that all three contribute. I also think the number of isolates referred to the ref lab is likely to be at least a 10-fold under-estimate of actual prevalence. It is important to note the increase in carbapenemases that fall outside of the ‘Big 5’ group (e.g. GES-5); we got hit with an outbreak of this that flew under the radar of our carbapenemase PCR. Figure 1: Stepwise increase in CPE referred to the national reference lab in England. There’s a key section on colistin resistance. The focus is on transferable colistin resistance, whereas it seems to me that mutational development of colistin resistance is a more pressing clinical threat. The importance of this issue is brought home by the concerning trend in colstin consumption in hospitals (Figure 2). I hadn’t heard of the Global Antimicrobial Resistance Surveillance System (GLASS) plan, which should yield vitally important data. Between 2012 and 2016, antibiotic prescribing (defined daily doses per 1000 inhabitants per day) reduced by 5% (see Figure 2). This decline was driven by reductions in GP antibiotic prescribing. 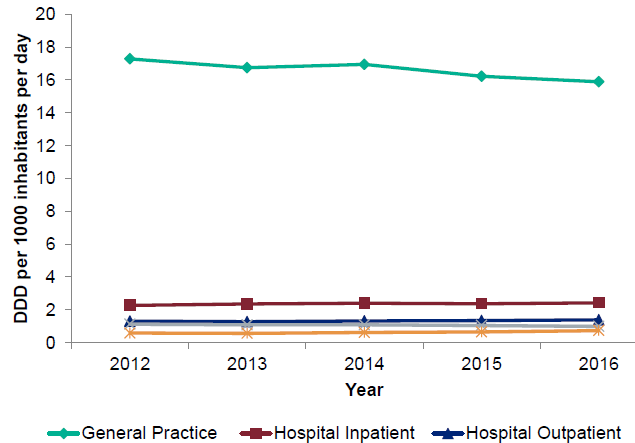 Meanwhile, there has been a 7% increase in prescribing to hospital inpatients over the same period. Figure 3: Total antibiotic consumption, expressed as DDD per 1000 inhabitants per day, England, 2012-2016. 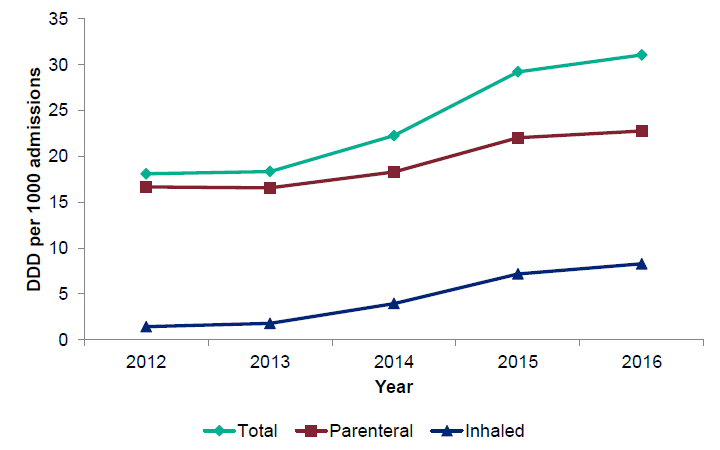 In hospitals, the consumption of both piperacillin/tazobactam and carbapenems increased up to 2015 but has decreased by 4% in 2016, which seems likely to be a direct impact of the CQUIN around reduced prescribing of broad spectrum antibiotic. There’s a whole chapter on progress with the Quality Premium and CQUINs around improved prescribing. The report includes summary data from the 2016 national Point Prevalence Survey (PPS). This was a huge undertaking that included 48,312 patients from 88 NHS Trusts and 6 private hospitals. It was somehow squeezed in by infection folk on top of everything else (a quick shout out to all those involved in the data collection and submission – both in our hospitals and elsewhere). 7% of patients had an HCAI and 33% were on an antimicrobial; this rose to almost 20% of patient with an HCAI and >50% on an antimicrobial in the ICU. Amazingly, these rates remain broadly the same as the last PPS in 2011. Pneumonia was the most common HCAI (29%) followed by UTI (17%) then SSI (15). This is important information, which is broadly consistent with the data used in the recent DALY-adjusted estimate of HCAI burden. Interesting to note in passing that methicillin-resistance in aureus was <10%. And useful to know the prevalence of peripheral vascular cannula (43%), central venous catheters (7%), urinary catheters (20%), and intubation (2%). ESPAUR and PHE have come up with a new national public awareness campaign, Keep Antibiotics Working, which launched recently. The report is huge, and hugely impressive. Nowhere else in the world has HCAI / AMR data on this scale and at this level of detail. There are reasons to be cheerful: levels of antibiotic resistance in GNBSIs are stable, and there has been progress in reducing antibiotic prescribing both in hospitals and in the community. However, the number of GNBSIs continues to increase, there are worrying trends in resistance to key agents (e.g. carbapenems), and there are large gaps in our understanding of the epidemiology around current trends. The report is focussed almost exclusively on Gram-negative bacteria, which makes sense, but we mustn’t lose sight of our Gram-positive friends. Finally, if you can’t wait for the next ESPAUR report, many of the metrics summarised in the report are now freely available for you to tinker with on Fingertips! Not scientific at all but a while back some urology colleagues did warn that “stopping” them from using fluoroquinolones freely (especially around urological procedures) to control CDAD will result in an increase in post-op infections. It would be interesting indeed to see if the increase in E coli (and Co) bacteraemias corresponds to an increase in post-op infections following urological procedures! We have an interesting natural experiment in progress right now in the UK with the national shortage of pip/taz; will this drive the use of agents with a higher risk of Cdiff? I am sure somebody is looking into this! Mustafa – building on your comment, there is a need to monitor for unintended consequences of the switch from empirical trimethoprim for LUTI to nitrofurantoin in terms of increases in upper UTI due to treatment failure associated with nitrofurantoin. I hope local health economies will plan to track this both in admissions and treatment failure rates.